Two Fifty One, formerly known as Eileen House, is set to become the latest addition to London’s iconic skyline. The scheme forms an integral part of the on-going regeneration of the Elephant & Castle area, with panoramic views over London. 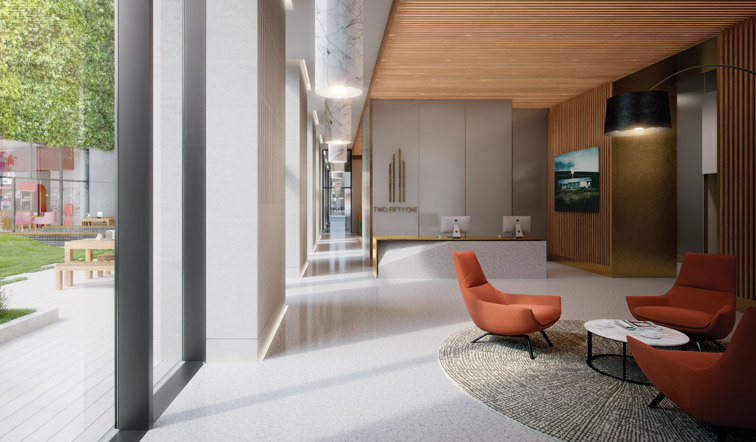 Located on the capital’s Southbank, the 0.51 acre, mixed-use development is set to provide a 41 storey residential tower, 3,100m² of modern office space and 280m² of new retail space. The tower’s amenities includes 24-hour concierge, Wi-Fi lounge, cinema club, health and spa club, entertaining space, cafes and bars, as well as fully glazed winter gardens. Waterman was appointed by ECA Development to provide a wide range of structural, building, environmental and transportation services for the project. The scheme’s structure is being developed to utilise Laing O’Rourke’s Design for Manufacturing and Assembly (DfMA) system throughout, using precast columns and lattice floor plank systems with a two storey basement constructed with a secant wall formed from an existing basement level. The same methodology was widely used in the Waterman designed mixed-use development at Elephant One (Tribeca Square) and has enabled the team to contribute positively in the development of the design programme to ensure it suits the process of DfMA and associated technologies. The DfMA structural solution has also required a change in ethos to ensure successful coordination of the various disciplines into the structural solution to maintain the delivery programme. This has enabled our drawings to be issued for ‘Construction’ and the BIM model to be released to Laing O’Rourke for the production of the precast concrete elements. The building services strategy will capitalise on this previous experience with Laing O’Rourke in the design of DfMA systems, with plant, riser and horizontal services distribution modules being built off-site. A ‘state-of-the-art’, low energy heating system will also be provided by centralised gas condensing boilers as part of the overall design, serving the whole site with hydraulic interface units provided for the apartments. To help users reduce energy use, apartments will be provided with an energy display to monitor energy use for heating, electricity and cooling. The energy strategy will be based on off-site renewables with provision made for future connection to a Multi Utility Service Company, providing Low Temperature Hot Water (LTHW) heating, chilled water, green water and off-site electricity. The energy strategy will also be based on the provision of on-site photovoltaics which will be installed as part of the base build. Our environmental team supported the completion of a coordinated environmental and geotechnical ground investigation. Through analysis and assessment of the environmental data the design team were able to demonstrate that the site represented a low environmental liability to ensure successful approval by Southwark Council. Our specialised teams also provided acoustic design and sustainability advice including guidance on building elements, waste and energy usage as well as acoustic specification of all building elements and building services plant. The wider design team is working closely with future residents of the development to ensure a high quality acoustic environment and the highest standard of sustainable living is in place.